Julian Jones is Vice-Principal and Deputy Vice-Chancellor at Heriot-Watt University, Edinburgh, with responsibility for strategic and operational planning. Since 1988, he has been at Heriot-Watt University, Edinburgh, establishing a research group in optical fibre sensors, optical instrumentation and laser-material interactions; he has over 500 publications. His interests have spanned the underlying physics and the engineering applications of fibre optics, of which a representative selection includes: monitoring techniques for laser welding; instrumentation for jet engine design experiments; pressure sensors used in experiments for mitigation of terrorist explosions; fluorescence techniques for detection of contamination in surgical instruments; quantitative measurements of wing shape in natural insect flight; and many more. He is a Director of OptoSci Ltd and a member the Scottish Science Advisory Council, advising the Scottish Government. 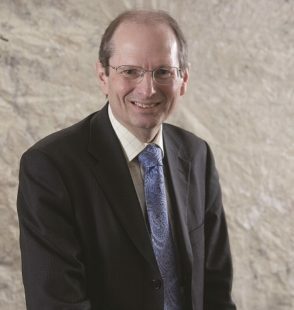 He has been President of the UK Consortium for Photonics and Optics, a member of the Technical Opportunities Panel of the EPSRC, and the RCUK Basic Technologies Strategic Advisory Committee. Professor Jones was appointed as Treasurer of the Institute of Physics in 2011. He is a Fellow of the Royal Society of Edinburgh, the Optical Society of America and the Institute of Physics. He was appointed as an Officer of the Order of the British Empire in the New Year’s Honours of 2002, ‘for services to science and engineering’.